Please feel free to correct the order of these or add any missing components or any other notes you might want to add. It was also suggested that we might want to order these in term of technical difficulty, i am gong to leave that part to more qualified people to determine. Sounds like you guys will end-up with a mere ui-lifting. Please bare in mind so far i only have the very basics represented here. Basically screens sort of fall into to 2 categories, screens where a front end editing experience make sense and screens where they don’t really. But in keeping with the original notion of merging the front and back ends from a ux standpoint i have mocked up one version each of both basic screens. thanks for your time and consideration! comments welcomed! That’s an interesting idea in general – having the site as one has a document in Mac version of Photoshop let’s say, with administrative blocks hovering on top of it as collapsible and draggable palettes. Although an alteration too dramatic for WordPress to accept as a part of the core I think. Thinking out loud about the Frontend editing process…. The first thing one sees is the default theme front page. A box up in the right corner to login. The user logs in. The dashboard bar shows at the top. Since it is the first login a link below the login box is seen: “tour the interface.” User clicks and a short video is seen. How to select a theme from the front end. 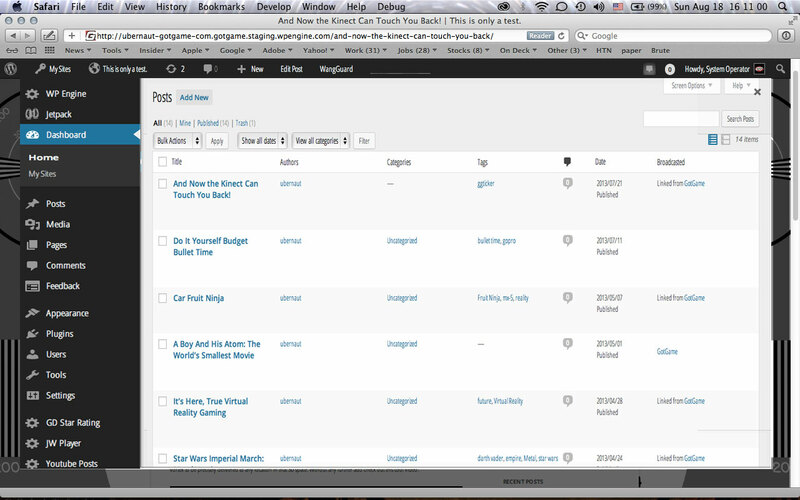 Perhaps a link all the way to the right of the Dashboard top bar with the name of “Choose Theme”. Click the link and see a drop down of small thumbnails and at the bottom of the drop down a see additional themes option. As the user moves the cursor over the thumbnails they are automatically bigger to the side of the drop down showing 2-3 fairly lage screenshots with some key info below the screenshots. The user selects a theme and the front end automatically adjusts to show the theme selected. Hover over elements on the page an outline is seen and one can click inside and an edit bar is seen. Drag elements around to replace. Turn on grid to align elements. Click directly on an menu link to move to the page. At the top Dashboard bar click the +New (OR use the Template button next to it to use an existing saved page) to create a post/page/category. A blank page is seen and blocks are seen on the right side (depending on if it is a post/page/category). Main elements – Header, menu, sidebar, content, footer. Elements (widgets, shortcodes, block elements all in one). One drags the various elements to create the page. Click the save button top right to the left of the login area. Beside it is the copy page button on hover it will say save as template. 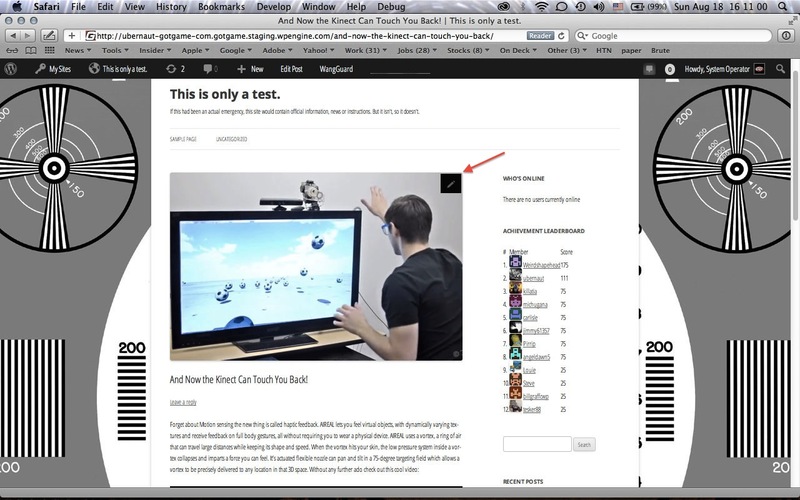 Create a new page – top right – save, copy, use template button. A lot of these things can be very similar on the backend and frontend. i like these ideas and agree across the board in terms of possibilities. 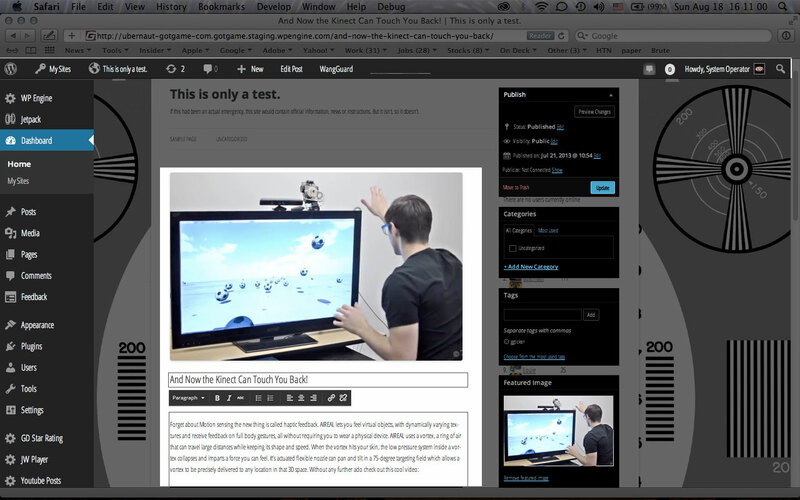 Some existing plugins to look at: Live Edit, Front End Editor, WP User Frontend. thanks for the links will definitely check those out asap! come one and all and bring your snacks! I missed it! I made a comment of avryls video on Vimeo. If you can post an update or some kind of recap from the chat that would be nice. you didn’t miss anything yet, happening in 3 hours. I did so since it gave me a better looking interface then what freenode has with their own web chat. meeting follow up here comments welcomed!